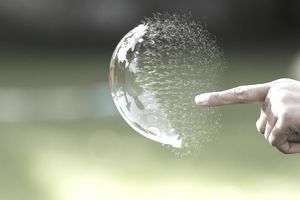 Most investors are intimately familiar with asset bubbles — whether through the 2008 sub-prime mortgage bubble, the 1999 dot-com bubble, or any number of earlier crises. While these bubbles are easy to identify in retrospect, they tend to be quite difficult to predict with any degree of accuracy beforehand. The good news is that there are a series of characteristics that investors can watch out for to potentially avoid these bubbles. In this article, we will take a look at 3 signs of asset bubbles and how investors can use them to identify potential problem areas in the market. The first tell-tale sign of an asset bubble is rising prices without improving underlying fundamentals. For example, the dot-com bubble saw a rapid expansion of price-earnings multiples among Internet companies. Many of these companies had little to no earnings, but commanded multi-billion dollar valuations anyway. This kind of irrational exuberance on the part of investors is a classic hallmark of an asset bubble. International investors may want to consider financial indicators that account for prices and valuations, such as the cyclically-adjusted price-earnings (“CAPE”) ratio. Often times, the market may be at risk of a bubble when the CAPE ratio gets overextended, but it’s worth noting that this isn’t always the case. Price-earnings ratios are impacted by things like the risk-free rate in the economy, which can change over time, independent of the asset itself. The second tell-tale sign of an asset bubble is excessive use of leverage — or debt. For example, the 2008 subprime mortgage crisis was caused in large part by banks providing clients with poor credit with access to easy money. This excessive leverage can come from financial innovations (like interest-only loans), cheap money (like low interest rate environments), or moral hazard (when individuals are protected from risk). International investors should watch for situations where excessive debt may be at play. For example, a country that has seen a sharp run-up in its debt-to-GDP ratio may be at risk of a bubble economy if its economy is being fueled by debt. On a more granular level, investors can look at the amount of debt used to purchase certain types of assets, such as housing or stocks, as a potential sign that a bubble may be rearing its head. Most asset bubbles can be traced back to politicians. For example, central banks might encourage excessive borrowing with low interest rates or federal regulations might create moral hazards and encourage people to take on big risks. These kinds of risks are particularly pronounced in centrally-controlled economies — such as communist countries — but they still exist in many developed countries as well — including the United States. International investors should look for political policies that might be creating asset bubbles and take the opportunity to exit the investment or even engage in a short sale. For example, Chinese regulators took a number of measures to shore up the stock market in 2015 following a crash, which may have contributed to another crash months later. The Federal Reserve's easy money policies from 1987 — 2006 may have also contributed to the real estate bubble in the U.S. Predicting asset bubbles is a notoriously difficult task. While it’s easy to see some of the tell-tale signs, it’s much more difficult to predict price declines with any timing accuracy. Markets can remain overpriced for years before crashing back to reality, which makes short-selling expensive and opportunity costs high for long investors. In fact, studies show that most investors are best off riding through downturns rather than trying to avoid them. That said, some international markets are easier to spot bubbles in than others and investors may want to adjust their asset allocations to improve risk profiles. Reducing risk might have a negative impact on returns, but these moves might be worth it if an investor expects to draw down an account over the near-term. Asset bubbles can have a significant impact on international investor returns. While they can be difficult to predict, there are some tell-tale signs that investors can look out for during the course of their research. International investors can take action to increase or decrease their exposure to certain markets based on these factors, although some research suggests that investors may be best off riding through such bubbles over the long-term.